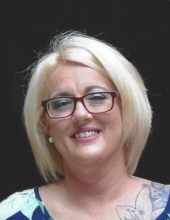 Lori A. Curtis, age 39, and the wife of Roger Curtis, passed away Saturday, January 5, 2019. She was born February 15, 1979 in Georgetown, Kentucky to Tracy Estes of Midway and Debra Wiley Dailey of Georgetown. Lori enjoyed crafts and her son's ball games. In addition to her husband and parents she is survived by her son, Lukas Curtis and Daughter Mackenzie Curtis. Lori is also survived by her brothers Eric Green, Cory Thompson and Jeremy Sharp, all of Georgetown, mother-in-law, Charlene Bowling of Georgetown, father-in-law, Roger Curtis of Lexington, maternal grandparents, Eugene and Mary Wiley of Frankfort, Aunt Cheryl Ligon of Frankfort, special cousin, Jennifer Purvis of Frankfort and several nieces and nephews. Visitation of friends will be Tuesday, January 8, 2019 from 12 to 2 with services at 2pm all at Tucker, Yocum & Wilson Funeral Home. Burial will be at Masonic Cemetery with Eric Green, Cory Thompson, Jeremy Sharp, Tyler Purvis, David Curtis and Tyler Daniels serving as pallbearers. To send flowers or a remembrance gift to the family of Lori A. Curtis, please visit our Tribute Store. "Email Address" would like to share the life celebration of Lori A. Curtis. Click on the "link" to go to share a favorite memory or leave a condolence message for the family.